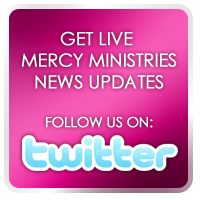 Mercy Ministries News: Nancy Alcorn Speaks at Her Home Church in Nashville, Tennessee! Nancy Alcorn Speaks at Her Home Church in Nashville, Tennessee! In her message, Nancy challenged the church community to get out of their comfortable pews and share the gospel with those who are hurting and broken. She reminded everyone to never judge based on outward appearance, because no matter how bad a situation looks, nothing is too hard for God, and what is in your past does not define your future. Therefore, if anyone is in Christ, he is a new creation; old things have passed away; behold, all things have become new. (NKJV) 2 Corinthians 5:17. Nancy also shared several stories of young women whose lives have been completely transformed by the love of Christ through Mercy Ministries. In one special moment, Nancy showed a photo of several babies whose mothers made the brave decision to choose life and come to Mercy when facing an unplanned pregnancy. Those babies are now all grown up, and one of them, Merri, was there for yesterday’s service. Merri’s birth mother placed her daughter for adoption with a wonderful Christian family from Christ Church, and Merri and her adoptive family have stayed very involved with Mercy through the years. A special thanks to Pastor Dan Scott and everyone at Christ Church for your amazing hearts and faithful support. We are so grateful for the love you have shown Nancy and the Mercy Ministries residents through the years.